This is a simple module that allows your users to login or register in a more noticeable way. This module does not requiring any editing or customization. Simply create this module and place it on any/all pages you desire your members to be able to login or register and it will work accordingly! 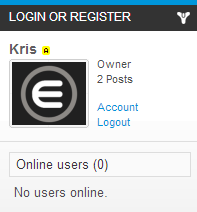 This is the general look when you are logged in, or logged out. Keep in mind that buttons, colors, and module background will differ on different themes/websites.